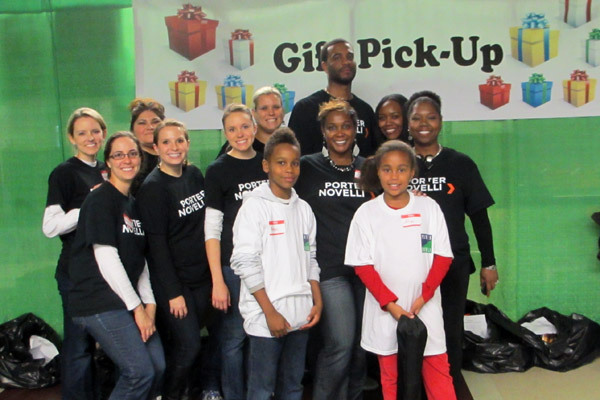 All across the agency, Porter Novelli colleagues find ways to give back to the communities in which they work. All across the agency, Porter Novelli colleagues find ways to give back to the communities in which they work. In Atlanta, we created the Works Wonders 31 Days of Giving program to bring the holiday spirit to life. The 2012 Works Wonders 31 Days of Giving and launched to staff after Thanksgiving. We are lucky to have an office full of colleagues who love to give back all throughout the year. At least quarterly, we participate as a group in volunteer projects, whether sorting food at the Atlanta Community Food Bank or playing bingo with seniors at a local assisted living home. We also have our capstone holiday projects that our staff looks forward to each year. For the past 5-6 years, we've helped hand out toys at the Empty Stocking Fund's Santa's Village where more than 50,000 children in Atlanta have a happier holiday thanks to the toys and educational items donated by our community. Last year, buoyed by the team's excitement to do more, we started the Works Wonders 31 Days of Giving. The Works Wonders team identified 31 different activities our staff could participate in – gathering empty paper towel rolls and toys for the Atlanta Humane Society; buying hats and gloves for homeless children; donating gently-used coats and blankets to a homeless shelter; recording a video for children at our local children's hospital, Children's Healthcare of Atlanta; donating blood at the Red Cross; sorting unused, sterile medical supplies at MedShare International, which ships them to third-world countries; or volunteering in a local soup kitchen. The response from our staff was simply amazing – they loved the opportunity to get engaged in a variety of ways and were happy to donate time, money, or useful items. Most of our volunteer opportunities were also family friendly, so our staff was able to bring their children, family, and friends to participate. It really galvanized our team and their families, and it reminded us all of the holiday spirit and the legacy of Porter Novelli.